If you are experiencing creditor harassment, speak with an attorney about your options. Learn how filing bankruptcy puts a stop to debt collection methods, as well as your other options for ending creditor contact. A Dallas bankruptcy attorney from our team at Allmand Law Firm, PLLC can help you look through your options. We also serve clients in the Mid Cities. It can be intimidating to receive phone calls from creditors, demanding money and even making threats. However, many creditors use intimidation and lies to accomplish their goals of obtaining money from people who owe debts. If you have been contacted repeatedly from creditors who refuse to stop or who make baseless threats, contact a skilled Dallas bankruptcy lawyer right away. We will help you stop creditor harassment so you can continue peacefully with your life. The following restrictions are laid out under federal law, including the Fair Debt Collections Practices Act (FDCPA) and the Telephone Consumer Protection Act (TCPA). These laws are designed to protect consumers from abuse and harassment from debt buyers and third party debt collectors. Texas state law also protects consumers. According to state law, you can legally record a call from your creditor. Creditors often use illegal debt collection practices that amount to creditor harassment. When they utilize these illegal means of collecting a debt, they can be held legally liable for their actions. Although you may not lose money, you lose time and effort when dealing with creditor harassment that is illegal. If a creditor takes any of the following actions, you should immediately contact a debtor defense attorney. A debt collection agency cannot contact third parties regarding your debt. There are exceptions, including your attorney, a credit reporting agency, and the original creditor. However, if they attempt to contact any other third party, especially friends or family members, then you should contact a bankruptcy attorney. A debt collector may contact a third party only for the purposes of finding out information about your whereabouts. In such a contact, they must state their name and the fact that they are trying to locate you. They cannot identify their employer, the debt collector, or state that you owe a debt. They also may not reach out to that third party more than once, and they may not communicate via post card. Once a debt collector knows that you are represented by an attorney, they must correspond with the attorney instead of you or a third party. To prevent creditor harassment of yourself and third parties, it is best to work with a debtor defense attorney. Debt collectors may not engage in creditor harassment. They must treat you with respect and abide by state and federal laws. If they communicate with you in a way that is harassment, oppressive, or abusive, then they may be held legally liable for their actions. Harassment may include calling you repeatedly or placing telephone calls to you without identifying themselves as a debt collector. It may also include listing your debt for sale to the public or identifying you as a debtor to others. Abusive actions may include using obscene or profane language or threatening to harm you or someone else. If a debt collector threatens to use violence, they are violating creditor harassment laws and possible criminal codes. Debt collectors must be very transparent about their purpose when they call you and send you correspondence. They cannot claim to be government authorities or the police. They also may not represent themselves as an attorney if they are not. If they falsely represent themselves in any way, they may be legally liable for their actions. Creditors must be honest about how much you owe and the amount the collection agency will receive. If a creditor calls you and you ask questions, they must be honest. They cannot threaten to take action against you that cannot legally be taken, such as repossession or wage garnishment. Although these actions may be available to them, if they are not, they cannot make such a threat. Creditor harassment may also include the use of unfair practices in collecting your debt. Creditors must be honest and abide by the terms of any agreements that you make with them. For example, if you give them a postdated check, they cannot deposit it prior to the date on the check. They also may not charge you interest fees, late charges, and other costs that are not authorized in your original agreement or contract. Creditors may not cause you to incur communications charges or charge you call fees. When creditors call you or send you mail, they must be discreet in communicating with you. They cannot tell third parties that you are a debtor, and they cannot identify their company to the third party. When sending you mail, they cannot use words or symbols on the outside of the envelope that indicates they are trying to collect a debt. If you are facing creditor harassment, you have rights. Contact a bankruptcy attorney who will stand up for you and walk you through the debt management process. Creditors seem powerful. They often take the law into their own hands and lie to create fear. A bankruptcy attorney can take control of the situation and make the creditor harassment stop. Creditors rarely listen to people who owe them money. Even if you threaten to report them, many creditors will continue calling and making threats. However, when they are contacted by a bankruptcy attorney, most creditors will stop harassment right away. You may have doubts about the money creditors say you owe. A skilled bankruptcy attorney can help you get proof of your debts from creditors. Just because someone is calling you, does not mean that the debt is one you owe. Oftentimes, creditors find people with similar names or matching addresses and attack them, asking for money. An attorney can help you verify a debt and stop creditor harassment. If you do owe the debt that a creditor is calling about, a bankruptcy attorney can help you negotiate with the company to pay that debt. Your attorney may help you seek more reasonable terms with payment options, or settle the debt for a lump sum amount that is lower than the total original amount. By engaging the creditor, your attorney can immediately stop creditor harassment and seek a beneficial outcome for you. If a creditor is harassing you, you likely feel overwhelmed and scared. You may fear losing your property or having your wages garnished. A creditor may even threaten to file a lawsuit against you. If someone is making threats regarding your debts, you should take the following steps to stop the creditor harassment. The first step you should take is to keep notes about the situation. Write down when and how frequently creditors call you. Also, write a detailed description of what they say and threats they make. If you ask them to stop calling or sent letters, document that as well. Second, you should contact a bankruptcy attorney to help you stop creditor harassment and deal with your debts. An attorney can inform your creditors that they should no longer contact you. Instead, creditors should contact your attorney to deal with any debts. Additionally, your attorney can help you enforce your rights against creditor harassment. Finally, go to court, if necessary. If your creditors continue to harass you, your attorney can help you fight back. You may sue creditors for harassment and emotional distress. With the notes you’ve taken and statements from your attorney, you can make creditor harassment stop. 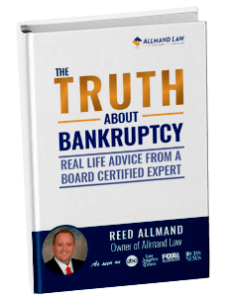 Attorney Reed Allmand is certified in Consumer Bankruptcy by the Texas Board of Legal Specialization. Our Dallas bankruptcy attorneys have years of collective experience and have helped tens of thousands of clients. When it comes to choosing a firm you trust, Allmand Law Firm, PLLC has a strong reputation as one of Texas’ leading bankruptcy firms. Call our Dallas bankruptcy lawyers today at (214) 884-4020 for a free financial empowerment session.